Savannah, meet The Collective Face Theatre Ensemble’s chameleon. The Boeing, Boeing and Death of a Salesman lead ultimately got into acting by accident. The couple met Barrett when she performed in Steel Magnolias and were invited to experience The Collective Face live and in person. “As soon as I saw them, I said, ‘Lynne, these are the people we want to work with,’” Salles remembers. Jones decided to audition for the ensemble’s production of Angels in America; supportive partner Salles accompanied her and ended up auditioning, too. Salles got his first role in What the Butler Saw. Surrounded by the incredible talent of The Collective Face, Salles was eager to gain knowledge and experience and truly tuned in as an attentive learner and team member. Being the new kid on the block hasn’t been easy. Salles remembers a moment in Pride and Prejudice rehearsals when he considered ditching theatre entirely. Poole, his mentor, explained that the way Salles was learning was actually the traditional method of developing acting skills: give the actor a small role here and there, and then bigger roles to stretch them. 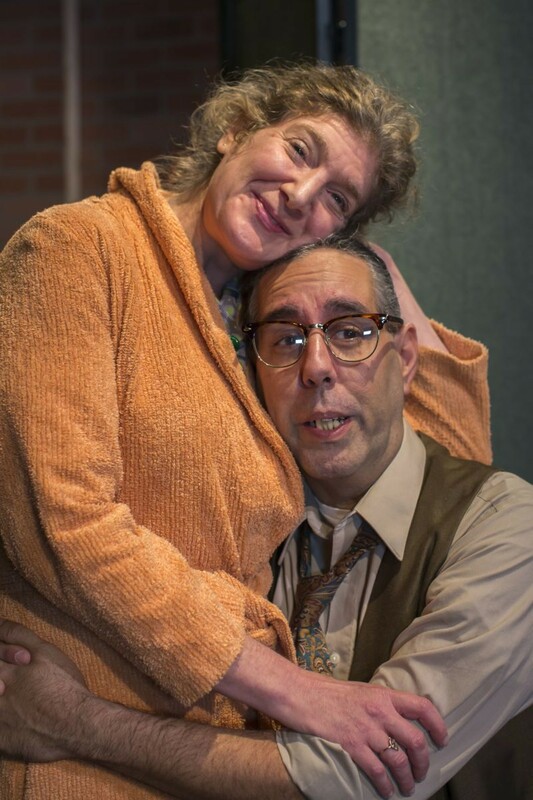 Playing the lead of Willy Loman in Death of a Salesman was certainly Salles’ biggest and most challenging role yet. “It’s considered to be the greatest American tragedy ever written, but the success has been just beyond my wildest dreams,” he marvels. The highest compliment came from an audience member who waited until Salles emerged from the dressing room to disclose that he thought Dustin Hoffman portrayed Willy Loman best—until he saw Salles. “The accolades have been like that—so over-the-top!” Salles says in disbelief. Even when fans are whipping out programs for him to sign at his day job at Lucky’s Market, Salles remains an indebted and humble fresh talent, singing the praises of his fellow cast and crew members. He advises that anyone looking to get into acting do their research. “An actor who doesn’t do their homework is a dead actor,” he states. The best advice he ever received came from Calendar Girls’ Karla Knudsen: You can’t fake life onstage. Salles returns in Collective Face’s 2016-17 season as Doolittle in Pygmalion. “I just got the script yesterday and am already doing my research!” the hardworking actor reveals. He’s looking forward to many more performances and can’t wait to get back on the stage.